Once you’ve mastered the on-camera flash techniques you might want to start thinking about how to take that flash off and get really creative. This is the good stuff. This is the “Strobist” stuff that you’ve heard so much about. There’s lots of information out there about choosing the right umbrella, the right softbox, making you’re own DIY grip gear, snoots, grids…bla, bla, bla, bla. None of that is going to do you any good if you don’t know the basics. This article is dedicated to helping you figure out those first few steps. First Thing: Make Those Flashes go POP! One way is to use the relatively new i-TTL (Nikon) or E-TTL (Canon) systems. These are pretty good systems but have their limitations. To use them, you need an on-camera flash, even if you don’t want it to fire. You also need all new, expensive flashes, and they have to be in the “line of sight” of your camera. Old flashes aren’t going to work, and forget about hiding a flash behind a rock or wall. The truth is, I don’t know a lot about these two systems because I don’t use them, I do it the old fashioned way. But they are very interesting and may be the future of flash photography. If you want more information look in your camera’s user’s manual or do some googles. Maybe I’ll cover Nikon’s i-TTL in the future, but it’s really not on my radar. It’s important to note that i-TTL and E-TTL work utilizing the TTL capabilities of your camera. That means that the flash and camera “talk” to each other. They can determine the proper flash output needed to make a properly exposed picture. All the systems I talk about below only make your flash fire… YOU have to manually set the flash output to properly expose the photo. I’ll explain all that below, as that is what this article is all about. You could use PC style sync cords. PC cords are reliable and relatively cheap, but the obvious problem is that you need wires running to all you flashes and they can very easily get in the way. They’re OK for studio use, but bad in the field. 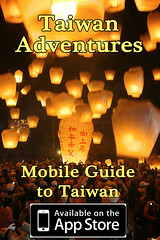 Small, relatively inexpensive, light activated slaves can be bought for any flash. They detect when another flash goes off in the room and then they make their flash fire. Easy, cheap, no wires. BUT they’re not very reliable, don’t work as well in bright daylight, and don’t work unless they’re in the “line of sight” of another flash that’s firing. The other problem is that they will fire when ANY flash goes off… yours, your friend’s, or the guy with the point-and-shoot standing behind you. I recommend buying one or two of these to start. I think they’re are great to have (and I have several in my bag for emergencies) but all the problems I mentioned above get annoying fast. Oh, yeah! This is the fun stuff. A few companies make radio transmitters that will tell your flashes to fire. They don’t need “line of site” and they even work through walls. Some of them work up to a kilometer away! The bad news is that you’re going to have to learn how to use your flashes while they’re set on “manual”. I recently bought a new set of transmitters. I did a lot of research into the different companies and found that the most reliable are Pocket Wizards (also the most expensive) and Cybersyncs. I went with the Cybersyncs because of the price and the small size of the transmitters and receivers (and I’m very happy). There are other brands and other opinions (and a bunch of new ones about to come out) but these are the two brands that I can recommend. Note- If you buy any of these online, make sure you get the right cords to connect them to your flash! Got the POP? What Next? Now you need to get your manual on. That means you need to set your camera to all manual. You’re going to need to set the shutter speed, aperture and ISO by yourself. You also need to make sure that the white balance is on “flash”. Let’s just start with some simple settings. Let’s say you’re in your living room and you’re going to take a portrait of your teddy bear. 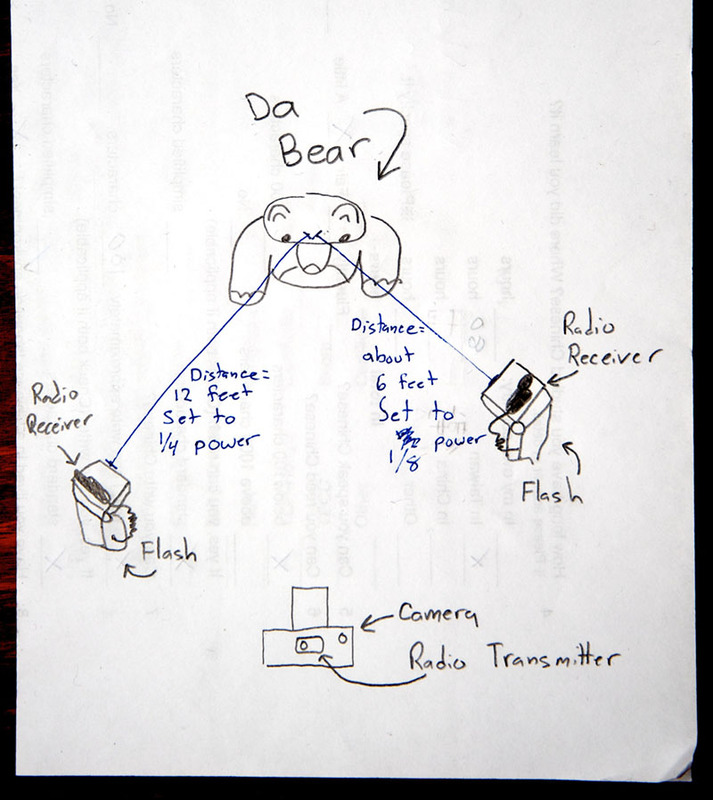 Put the bear on the stool, aim your flashes at it, put the transmitters and receivers on all of them, and follow the directions below. Now you need to adjust the flash output to give you a properly exposed picture. Flashes can be set to be brighter or darker, that’s called the “output.” First, make sure the flash is set on “manual”, not TTL or anything else. Most flashes (at least all the one’s I have) have some kind of a guide on the back to help you determine the proper output for the picture you’re about to take. They’ll give you places to set the aperture and the ISO. You don’t need to use these, but I usually do because I find it a lot easier to get close to the proper output (and therefore exposure). Obviously, they should now be set to f/5.6 and ISO 200. Now look for the distance guage. 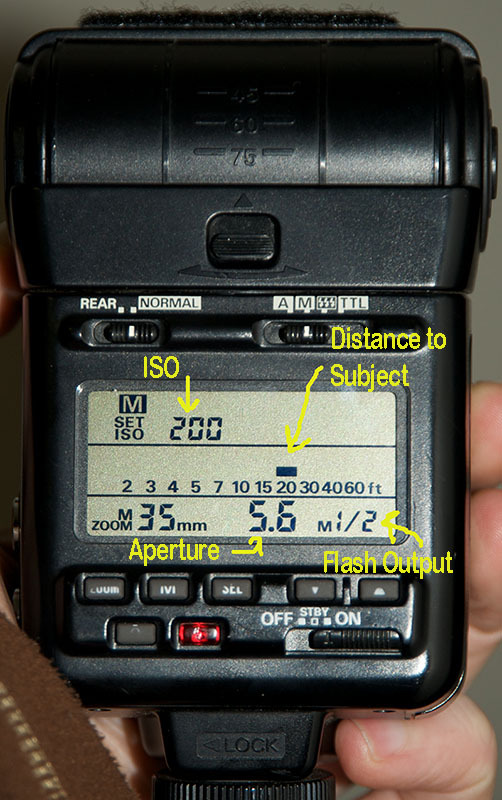 This will tell you at what distance from your subject to put the flashes. Or you can adjust the output to make that distance closer or farther. Do this step for all your flashes (if you have more than 0ne) and set them for the approximate proper distances to the bear. Go take a picture. It should be pretty close to the proper exposure, but you might need to adjust one or two of the flashes a little. You can either adjust the output on the back of the flash or just move the flash closer or farther away from your bear. That should be it. You might want to try moving the flashes around the bear to see what differences it will make if they’re in front of the bear or behind it, but make sure you don’t change the distance from the flash to the bear (or if you do, you’ll need to adjust the output accordingly). This is the most important setting when shooting with remote flashes. Opening or closing the aperture will affect how much light is hitting the sensor. It doesn’t matter if that light is the ambient light or the the light from the flash. It’s best to choose an aperture that’s about right for the scene and stick with it. I usually find that an aperture of about f/5.6 is a good starting point. Opening up to f/4 will make you flashes over expose by one stop (if they were set properly for f/5.6). Closing you camera’s aperture a stop will make the flashes underexpose by a stop. Adjusting this is fairly similar to adjusting the Aperture. If you go from ISO 200 to 100, you’ll need to make the flashes a stop faster. When shooting with flashes like this, your shutter speed isn’t going to affect your flashes at all. By changing it, all your doing is affecting the ambient light. Most cameras have a flash sync of 1/250 (some only 1/125, check your user’s manual). That means that you need to keep the shutter speed at that number or below. If you make the shutter speed higher, the camera won’t see your flash. But I’ll say it again, adjusting the shutter speed from 1/250 to 1/125 or even 1 second will not affect the light coming from the flash, it will only affect the ambient light. PS – Here are a couple I used off-camera flash for this weekend. Nice write up. Couple of notes from the Canon side of things. Flash sync speed varies between models. My 5D mk II syncs at 1/200 but the 40D at 1/250. For Canon users, check the flash sync speed and set that as your shutter speed if it’s not 1/250 as mentioned above. My Canon flashes, which are all at least 5 years old, don’t allow entering the ISO and aperture on them when shooting manually, they just have a distance scale. I’m not sure about the newer models. Many years of trial and error means I can get pretty close due to my experience without these, but those of you new to flash might want to check this first. And for manual use with radio transmitters only, Canon people can use Nikon flashes and vice versa. You can’t use a Nikon flash mounted on a Canon but you can if it’s on a stand and being triggered by something else. You definately need to check your cameras User Manual to get the proper flash sync. BUT, many of them can be “pushed” a stop or two also. I often shoot with my D700 and D2x at 1/320 of a sec and it has no effect on the flash. At 1/400th of a sec, a black band will start to creep up if I’m shooting with flashes as my main lights… If I’m mixing a good bit of ambient into the pic, you don’t see that black band and as long as the subject that I want illuminated with the flashes isn’t down there, it’s very usable. It seems strange that Canon give you a distance scale that would be wrong if you’re shooting at a different ISO… Is it always locked a 100? And yes, if you’re using flashes off-camera and set manually, you can use any brand. I often use some Sunpak 555s, but left them out of this blog. The flashes I have were released in the pre-digital days, so ISO would have been a bit more limited. They can “read” the ISO set on the camera if it’s connected via E-TTL, but unless there’s a custom setting buried in the menu that I’ve never found, the scale will not be accurate when set up manually. Trust me, the pre-digital days had plenty of ISOs! (Although then they were usually called ASAs!) On my SB-800, to change the ISO manually, you do have to go into the custom menus, but it’s not a big deal. Truth is, I don’t ever change it, I just do the math in my head, but I wrote this article for absolute beginners and I thought that would be easiest. Funny thing is, my old SB-24 is much easier to change. All you have to do is hit the select button until it lights up. I don’t know why Nikon would want to make that harder on the new ones… Another thing that bothers me is that I don’t understand why the flash head has to be pointed directly forward (not sure about Canons on this). If you have the head pointed up, the distance guide doesn’t show. Hmmm…. This was a long, difficult one! Speaking of ISO, I find I use a lot more variety these days, although having usable 6400 in the 5DII helps. Before digital, I would shoot Velvia, Provia, Reala and Tri-X and that was about it. Tried out some 800 print film a few times, and occasionally used Fuji NPH @320 and whatever the Kodak 400 C41 bw film was – I can’t remember the name. So most of the time, I was shooting at 400 or slower. These days, I’m in heaven with high-ISO. Did you buy your Cybersyncs in Taiwan? No, I got them in the US. I think you have to order them directly from Paul C. Buff. $20 from Japan, over the web> JIANISI PT-04TM Wireless Flash Trigger (Transmitter) w Receiver ( compare Pocket Wizard)…small & awesome (2 week shipping). Getting me outta difficult scenarios. Love it! I own a Nikon D50 DSLR, yes I know it’s ancient but still works like a dream, I recently bought a SB900. It was quite a mission to get if all figured out as it is my first speed light ever. I usually expose for the scene and then toggle around in TTL to get the right flash exposure, but never have i even considered the sync speed, maybe this is because i usually shoot in aperture.(?) My camera syncs as 1/500. Where and when should i consider sync speed? I am self taught, but now there is just no more self left to teach me! please help. If you are shooting in aperture priority mode, with the flash attached to the camera, you don’t have to worry about the sync speed at all, the camera will do it for you. You have to start worrying about it when you take the flash off and use radio transmitters to trigger them. But, playing with the shutter speed is a fun thing to do when using a flash! Try taking some photos in manual mode at night and keep lowering the shutter speed until you start getting interesting effects! I recently bought a Canon 60D and 3 430ex II speedlite, upgraded from a 1000d and one speedlite which I used after university. Having great fun with the wireless flash guns and the ability to use the camera to manually set their power. Been trying tonight with lowing the shutter speeds and changing the flash guns positions, and as you said there are some very interesting effects that come from that. you don’t even need digital flashes. I use 3 old Metz flashes for 30 euros for my set-up. Of course it’s a little more try and error to get the right lighting but if you go out and try a little its no problem. It usually takes like 3 trys to get it right!